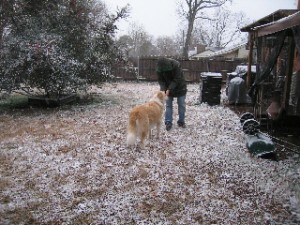 It is snowing in Dallas, Texas on Christmas Eve, 2009. The chances of having a White Christmas in the Dallas, Texas area on any given year is less than 5 % so that makes this year special for sure. In our suburb of Irving, Texas the precipitation started as rain around 11AM, changed to a light snow mist and then turned to snow at approximately 12 noon. We are under a winter storm warning until 6PM and expect accumulation of 1-2 inches. It is cold with an expected high today of only 44 degrees and a low of 30 degrees. A wind advisory has been posted through 9PM this evening adding to our winter Christmas snowstorm in North Texas. The skies will clear later this evening with overnight temperatures dipping into the 20’s. As of early afternoon on Christmas Eve, December 24th, 2009 there is not enough snow on the ground in our neighborhood to build a snowman but maybe later. Bundle up, build a fire in the fireplace, sip a hot drink and enjoy this year’s White Christmas in Dallas, Texas. This entry was posted in Texas, Texas Events and tagged rare Christmas snowstorm Dallas North Texas, snowstorm on Christmas Dallas Texas, White Christmas Dallas Texas 2009. Bookmark the permalink. Its nice to have snow in Texas.